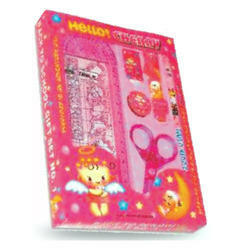 We are one of the leading manufacturers and exporters of a wide range of Kid Stationery and Gift Sets. We manufacture these stationery items and gift sets from quality raw materials, following the industrial standards. Our range includes assorted fancy pencil sharpeners, clock stationery sets, school kits and pencil cases. We are the eminent manufacturers and exporters of New Hobby Stationery Kit that is manufactured out of quality raw material. 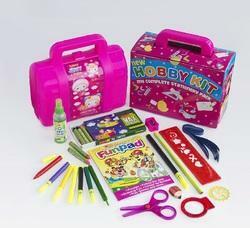 This kit consists of all the essentials required by your children to conduct a drawing activity. It includes eraser, crayons, sharpeners, scale, pencils, sketch pens and drawing papers. It is available in yellow, pink and blue colors. A box is provided to easily carry all the essentials of the kit. We manufacture and export Assorted Pencil Sharpeners which are used to sharpen pencils before writing. 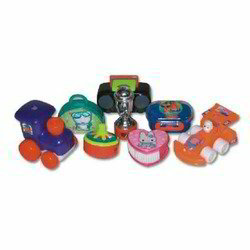 These are different kinds of sharpeners of different colors, designs, shapes and sizes. Quality raw material is used to manufacture these sharpeners. 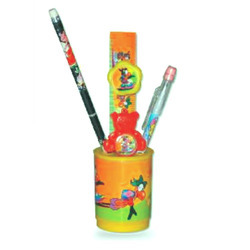 Our clients can avail these fancy pencil sharpeners in various attractive shapes and sizes. We offer assorted fancy pencil sharpeners that offer a safe use and are long lasting. 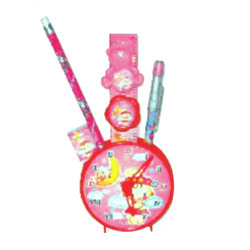 We offer Clock Stationery Set that comprises of scale, eraser, sharpener, mini crayons, teddy puzzle, two pencils and a clock stand. An interesting clock shape of the stand makes the stationery set looks charming. 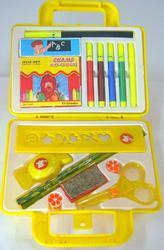 This stationery set is available in red, yellow and blue colors. We manufacture this set using optimum quality material. 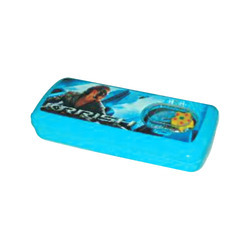 It offers a smooth shape, good finishing, safe use and a long life. We offer Car Stationery Set in yellow, red and blue colors. The car shaped stand along with the small design patterns accentuates the look and beauty of the set. It consists of scale, teddy puzzle, eraser, mini crayons, sharpener, two pencils and a clock stand. Study time is going to be much more fun with this set. This set easily fits in the bag of your kids and is easy to carry. Our clients can avail this stationery set at market leading prices. We offer Stamp Stationery Set which is meant for children aged four years and above. This set has a fairy design and includes scale, two pencils, eraser, mini crayons, sharpener, teddy puzzle and a clock stand. Our clients can avail this beautiful stamp shaped set in red, yellow and blue colors. The quality of this stationery set is ensured to match the needs of our clients. It is easy to carry and ready to use. This Mini Stationery Set is available in shades of red, yellow and blue to cater to your specific requirements. It comes in a round shape and has colorful and attractive cartoon designs. It is available in a standard size and offers a smooth finish round the corners. It is ready to use and is lightweight. It includes scale, eraser, sharpener, mini crayons, flying disc cards, two pencils and an elliptical stand. We are the prominent manufacturers and exporters of Animal Stationery Set. This stationery set consists of scale, eraser, mini crayons, sharpener, puzzles, two pencils and an animal stand. 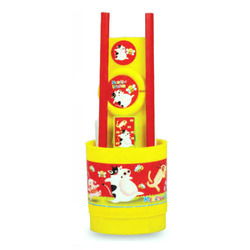 Available in red, yellow and blue colors, this pretty stationery stand offers a smooth finishing across the edges. It is lightweight and easy to carry. Quality raw material used ensures that it is safe to use and is non-hazardous. Teddy Stationery Set comprises of scale, eraser, sharpener, pencil, N.S. pencil, mini crayons and a round stand. This beautiful stationery set has colorful and captivating design patterns which enhance the overall look. 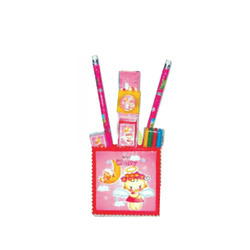 Made available in red, yellow and blue colors, this stationery set is manufactured using optimum quality raw material. It easily fits in the bags and offers a smooth finish. We present Lollipop Set that comprises of scale, sharpener, eraser, mini crayons, two pencils, fun cards and elliptical square stand. 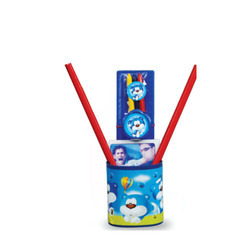 This set is manufactured using quality raw material and is made available in red, yellow and blue colors. Children aged four years and above are apt to use this set. It offers durability without any defects in its design and shape. We ensure that the end product is safe to use and is non-hazardous. We offer a beautiful Phone Stationery Set that includes sharpener, scale, eraser, two pencils, mini crayons, fun cards and elliptical square stand. 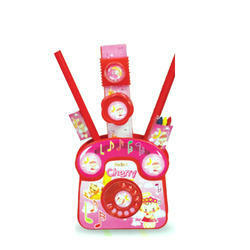 An attractive telephone shape is eye catching and gains the attention of children right away. Manufactured using supreme quality raw material, this telephone stationery stand is available in red, blue and yellow colors. It is lightweight and safe to use. Back to School No.1 Stationery Kit is an interesting school kit offered by us which will be definitely liked by your kids. It includes stencil pencil case, plastic scissors, two sketch pens, eraser, sharpener and pencils. 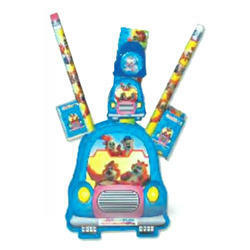 It can be availed with innovative cartoon designs in red and blue color. The products are designed and shaped to offer a safe use. The raw materials used to manufacture this kit are non-hazardous. We present a uniquely designed Lollipop Stationary Set for your school going kids. This kit offers scale, eraser, toffee sharpener, plastic scissors, pencils, mini sketch pens, sketch pen, crayons and fun toys. New hobby kit comes in eye pleasing colors such as pink, blue and yellow. The contents of the kit are manufactured using supreme quality raw material that is non-hazardous. Our clients can avail this kit at market leading prices. 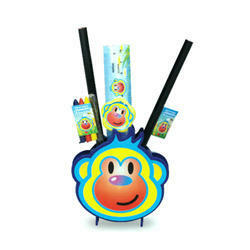 Friend Pencil Case is a creatively designed pencil case to hold a large number of contents. The contents include pencil case with enclosure for pencil holder and eraser. Attractive colors of yellow, pink and blue enhance the look of this pencil case. It is designed to offer a firm shape and smooth finishing at the edges. The quality raw material used to manufacture this case is safe and non-hazardous. 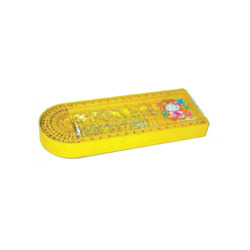 All-In-One Pencil Case includes pencil case with stencil, protractor and scale. All-in-one pencil case is manufactured using optimum quality raw material and designed to offer a smooth shape and finishing. Our clients can avail this pencil case in yellow, blue and red colors. It offers high durability with maximum usage. This pencil case is apt to hold an ample amount of contents. Looking for Kid Stationery & Gift Sets ?